Cooking ribeye steak perfectly has never been easier. The secret really comes down to one technique that does not involve expensive equipment. 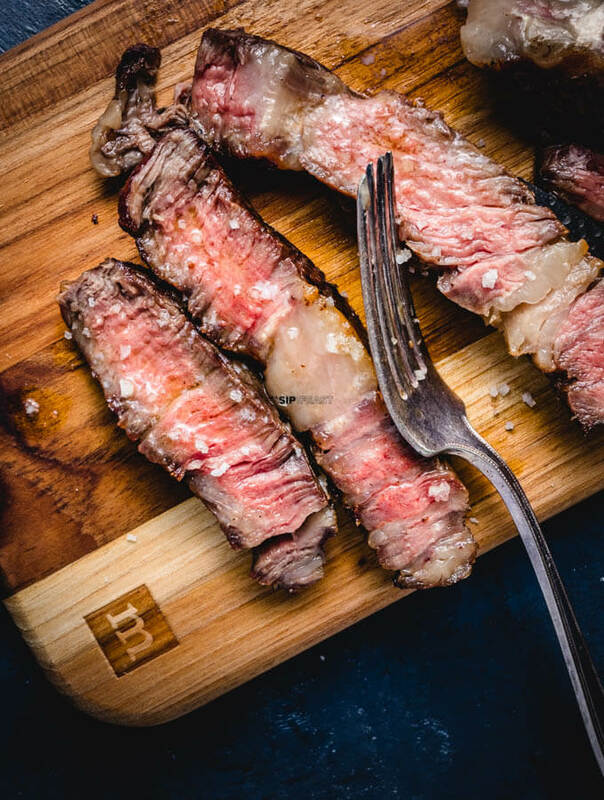 Looks just like a steakhouse.The “reverse sear method” – it’s a foolproof way to get a perfectly cooked steak every single time. Before you get started on your killer steak make this Classic martini with blue cheese olives – It goes so well with a thick steak! Normally in a steakhouse, the meat is cooked either on an open grill or a snake broiler which can top 1800 degrees. The snake broiler method employed by Peter Luger’s and many other high-end steakhouses, does a combination of the two. They will grill it outright, place it in a broiler safe dish and snake broil it for a couple of minutes. The charred top is super delicious and smells amazing. If you have never been to Luger’s I suggest making a reservation when you are in New York. So thanks James for telling me about how awesome Peter Luger’s is, but can you get to how I make a perfect steak? Simple – cheating with a reverse sear method. In this way we can get a perfectly cooked steak. The steak will still have an awesome seared crust and will never be overcooked. Cooking ribeye steak the more “traditional way”, requires a little more finesse. Can it be done? Sure – but I like easy. Cooking a steak with the reverse sear method is foolproof. With an instant read thermometer, the steak is cooked exactly to within 10-15 degrees of final doneness. Finish it up with 1 minute of searing per side and it is perfect every time. I love a steak medium-rare, but my son likes it towards the medium-well side so I try to accommodate him as best I can. 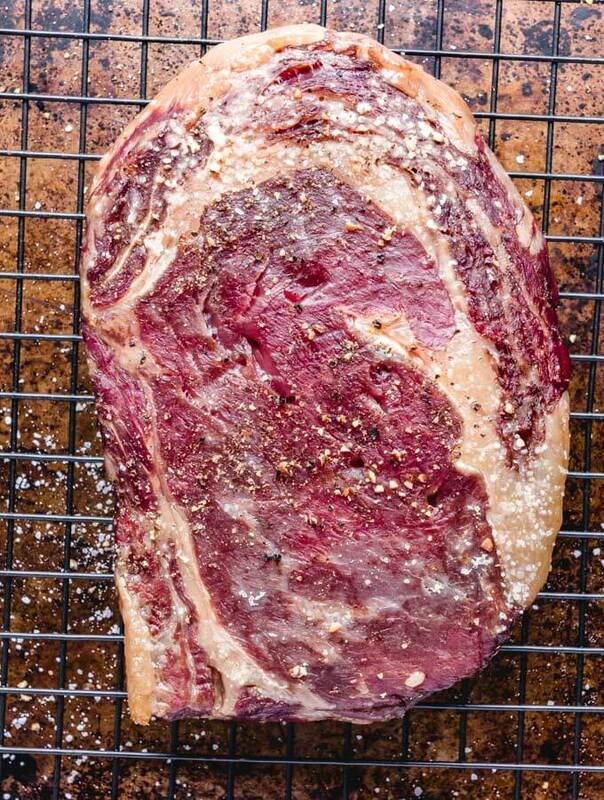 Cooking ribeye steaks like this is simple because I can take each steak to the right temperature before the reverse searing process. Have some people coming over and each likes a different doneness? No problem – you get the idea! An instant read thermometer is essentail for reverse searing. 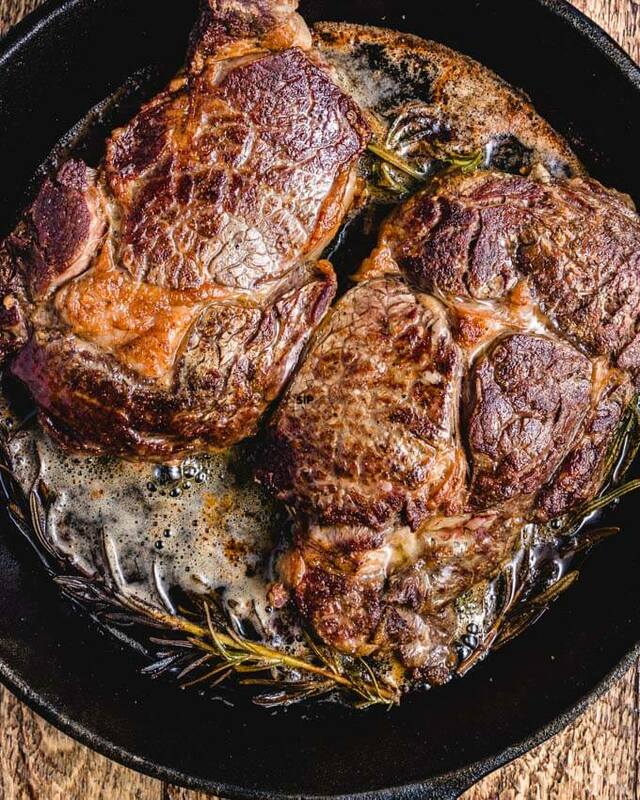 A 12″ cast iron pan can accommodate 2 large steaks. Select grade – Will look really red and have no marbling at all. Choice grade – Has more marbling than select but is still better for marinating or heavy spice rubs. Prime grade – This is the quality that is most often served in high-end steakhouses. It has excellent marbling and tastes awesome with just salt. Kobe and Wagyu – The best and highest marbled beef. It has a very unique look, and a very high price tag to go along with it. The American Wagyu Association has all the good info if you crave this very special beef. Quality steaks are really important when not marinating or heavily seasoning. Why? Because it’s all about the flavor of the steak. 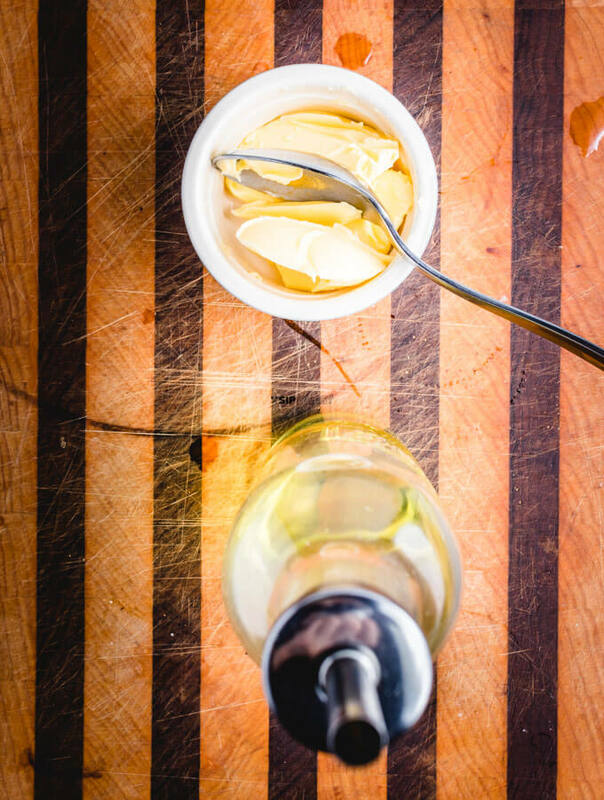 Nothing is hiding or masking the flavor. 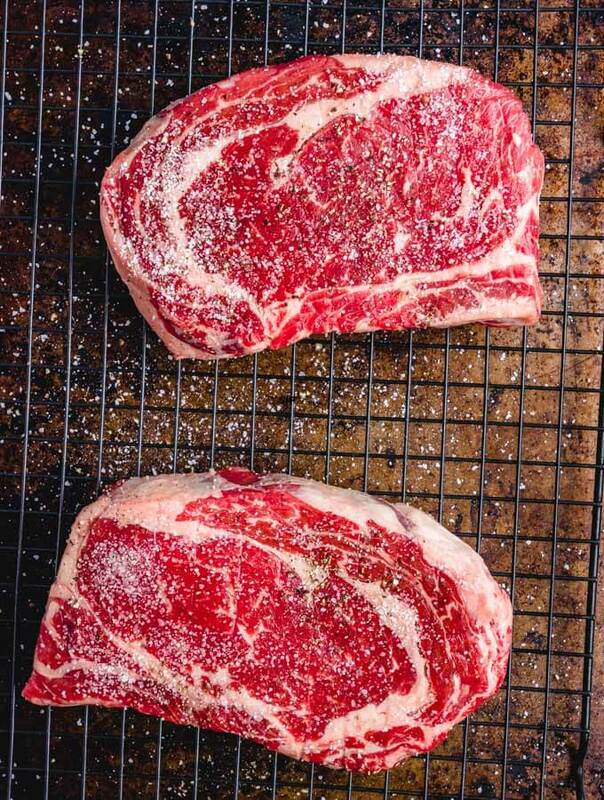 With just butter, salt, and pepper for this recipe I suggest splurging for prime grade beef. It will never let you down. To get quality beef at a fair price, Costco should always be a first consideration. Whole Foods prices have gotten a lot better with the Amazon takeover as well. Just remember, prime grade beef will always be much higher priced than choice grade. Need to do a bunch of steaks? I have still made a perfect steak with their choice cuts. You may need to spend a few more minutes picking through the choice beef. Sometimes I have found great marbled choice cuts, probably due to an error at the store or a grading mistake. To me nothing does a better job cooking ribeye steak than the reverse sear method. Ribeyes have the perfect amount of fat content. That fat means juicy, delicious flavor! The marbling of the fat gives it an unbelievable taste – a taste that simply can’t be found in a filet. I definitely enjoy other cuts of beef too. 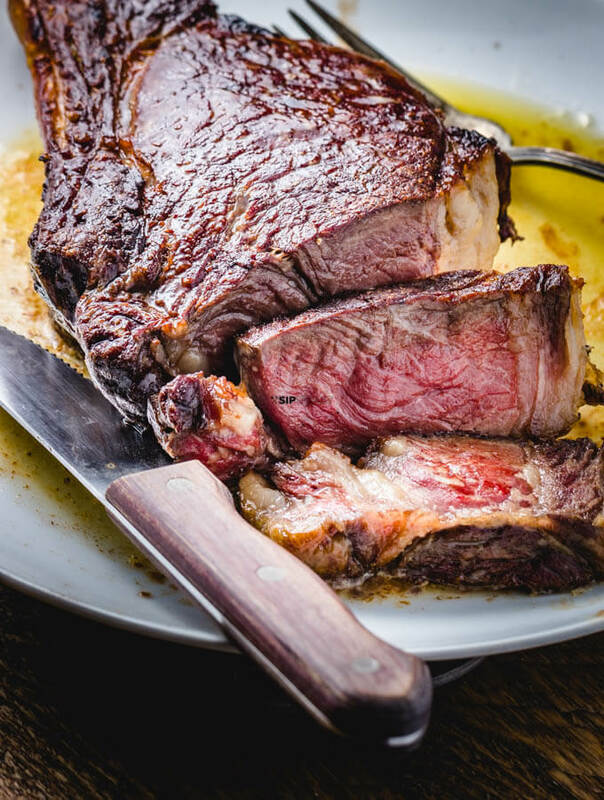 A porterhouse would be excellent as well – if that’s your favorite, go buy some good ones. The recipe will work exactly the same. A New York strip would also be a solid choice. I don’t recommend this technique with a skirt steak, flank, or other thinner cuts. With those I would just cook them straight on the grill. I love those cuts, especially skirt steak, but for this recipe get a thick steak, preferably a 2″ thick ribeye! 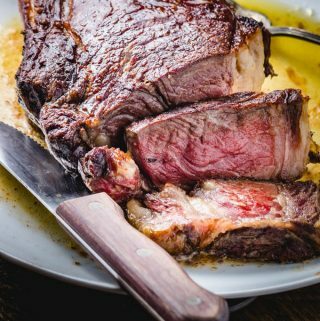 How to cook any big steak in a pan? Cook it as hot as possible to get the absolute best sear. 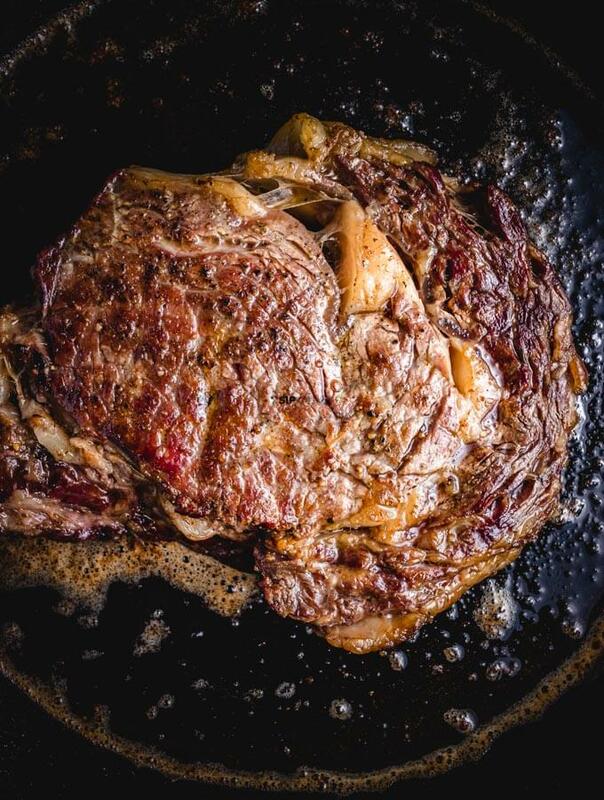 The sear is such a crucial part of the ultimate steak experience. Cast Iron works especially well at charring the steak. If you don’t have a cast iron, a heavy steel pan would work as well. I have cooked great reverse seared steaks that way too. Just take your time getting the pan screaming hot. The cast iron can definitely take the beating – just remember to open the windows. What type of oil to cook steaks in? High smoking point oils are the way to go. I use vegetable oil to get a great sear- I do not recommend olive oil as it will burn too easily and working at a super high heat is paramount. The butter goes in at the end of the steak searing process so that is not a big burning concern. Tips on cooking steak: Reverse sear is just a perfect way to take the guess work out of cooking a big meal. Timing a hot steak is simple with this method. A steak can be cooked through in the oven and covered with foil for hours before beginning the searing process. This works out real well when some other dishes are being prepared. The steak is always ready to go. It can even be wrapped and put in the fridge overnight. If doing this make sure to get the steak out early to get it up to room temperature! Add rosemary if desired for a drastic but delicious change in flavor. Another pick of rosemary ribeyes. This is a simple option if you love rosemary. Remove steaks from refrigerator about 1 hour before cooking. Preheat oven to 250°F – the lower the better but the meat will take longer. Season ribeyes on wire rack and baking tray setup. Add about 1/2-1 tsp of salt and 1/8 tsp of pepper per steak. Place steaks in oven and cook for about 1 hour for 2 inch thick steaks. 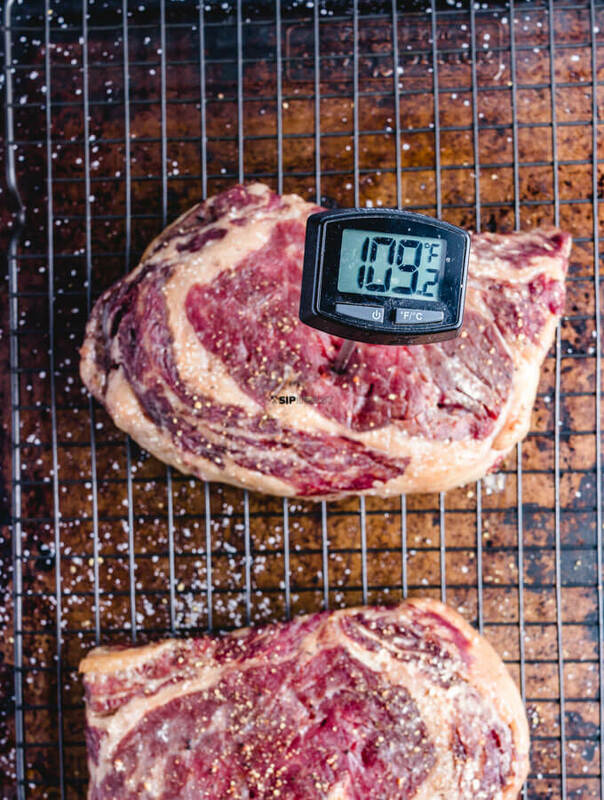 Start checking temperature of steaks with an instant read thermometer at the 45 minute mark. Remove steaks at 115°F for medium-rare. Medium-rare is 130°F-135°F. The steaks will be seared to this temperature so make sure to remove from oven at no higher than 115°F-120°F if medium-rare is desired. Let steaks rest for 15 minutes, lightly covered before searing them. 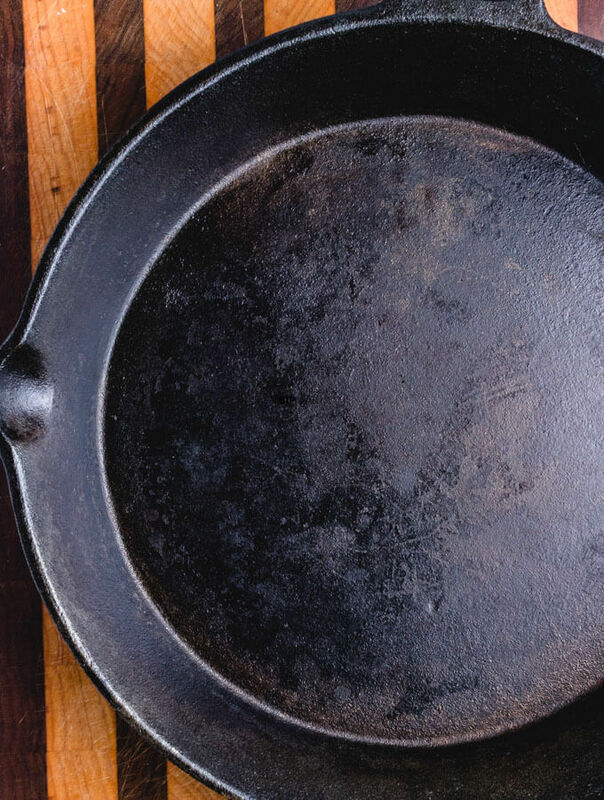 Preheat cast iron or heavy steel skillet on your hottest burner to super hot levels. Give it a few minutes to get real hot. Open a window and/or turn on an exhaust vent. Sear steaks for 1 minute on each side in 1-2 Tbsp of vegetable oil. Add 2 Tbsp of butter during last 30 seconds of searing. 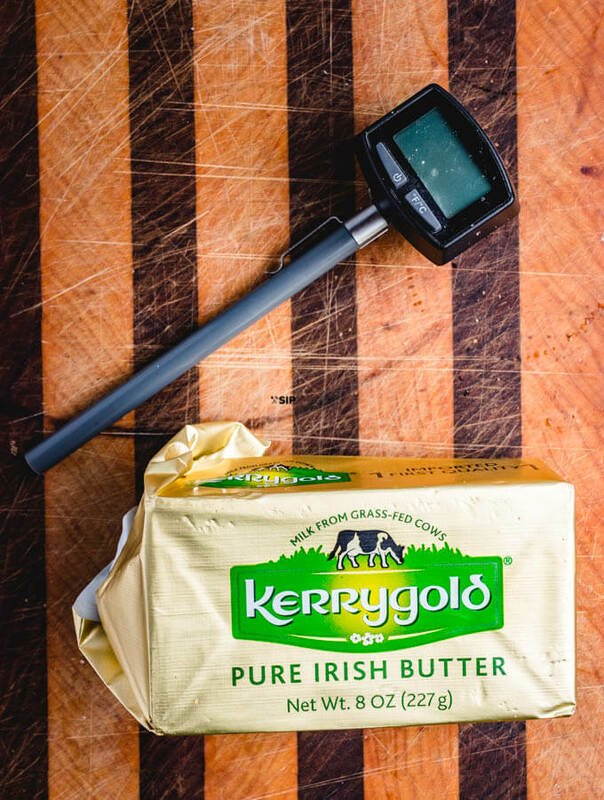 Remove steaks and pour butter mixture over top and serve immediately. Place some foil underneath the wire rack for easy cleanup. Almost ready for searing, this temp would be perfect to remove at for rare steaks. Removed and ready for 15 minutes of rest, before the searing. Cooking ribeye steaks in the oil and butter. Do you want to grill a steak outside? Check out my friend Ben’s post from Ramshackle Pantry on Grilling steak like a boss. He is a great writer and has a ton of great content on his site. To get that full steakhouse experience why not have the perfect drink? This Classic martini with blue cheese olives absolutely delivers. My wife Tara comes up with awesome drink ideas every week. Looking for another drink that compliments a steak? Try this delicious negroni recipe. A negroni is a great match for a steak! 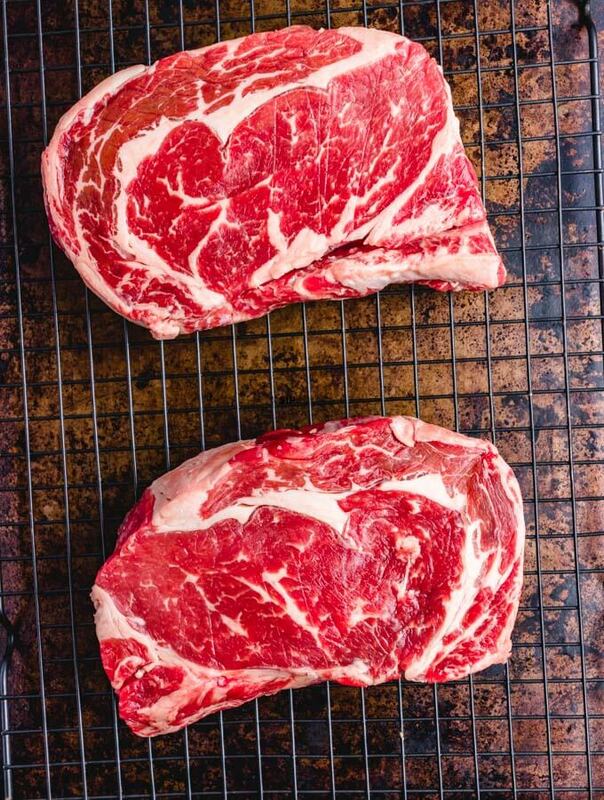 2 large ribeye steaks - 1.5"-2" thick steaks. Remove steaks from fridge 1 hour before cooking. Preheat oven to 250f - the lower the better but the meat will take longer. Do not go over 275f. Season Ribeyes on wire rack and baking tray setup. Lay foil under wire rack for an easier cleanup. Pat steaks dry then add about 1/2-1 tsp of salt and 1/8 tsp of pepper per steak. Salt generously! Remember the steaks are thick. Place steaks in oven and cook for about 1 hour for 2 inch thick steaks. Time will vary based on size of steak. Start checking temperature of steaks with an instant read thermometer at 45 minute mark. Remove steaks from oven at 115f for medium-rare. Medium-rare is 130f-135f. The steaks will be seared to this temperature so make sure to remove from oven at no higher than 115f-120f if medium-rare is desired. Let steaks rest for 15 minutes before searing. Preheat cast iron or heavy steel skillet on hottest burner to as hot as it will get. Give it a couple minutes to get super hot. Open a window and/or turn on exhaust vent because the searing process will create a lot of smoke. This recipe will work just as well with any thick steak. 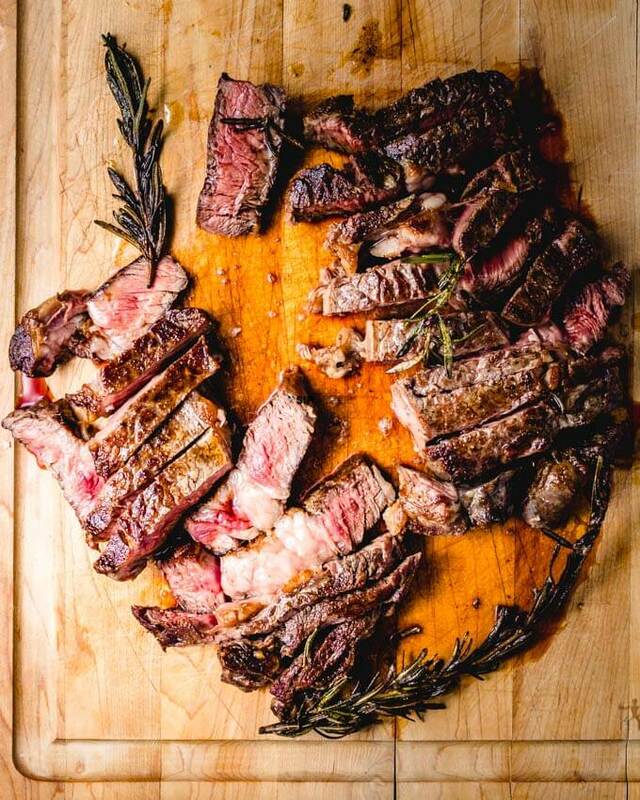 A porterhouse or NY strip would also make a perfect steak. 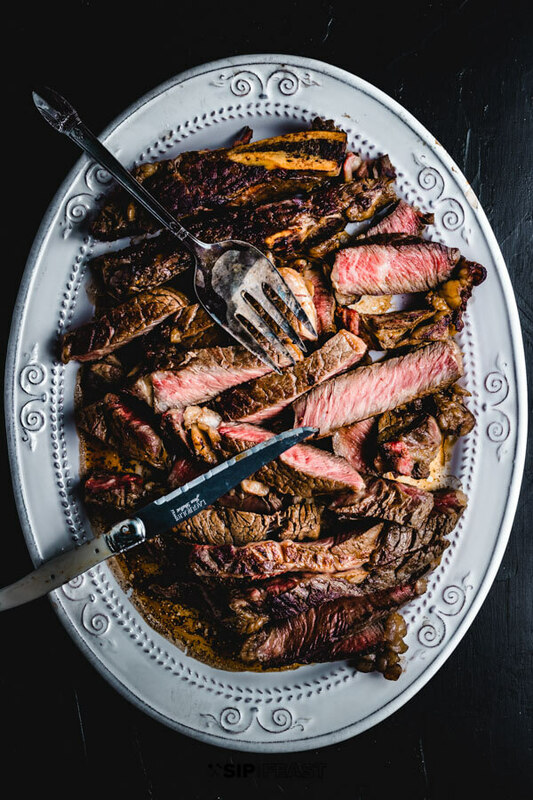 If you liked this recipe on how to cook a ribeye steak, we’d really appreciate it if you would share it on Instagram or Facebook using #sipandfeast. Looks so dang Tasty! Looooove me some good steak. Thanks Ben! Yes, it’s very hard to beat a good steak.